I’d like to say a quick thank-you to the lovely and talented Heather for covering this week’s Castle post for me once again! Two Sentence Summary When the creator of a show very similar to Saturday Night Live is murdered, Castle and Beckett wind up on set and inadvertently upstage a parody of their partnership. Meanwhile, Martha worries about her new show debuting in a technological world that was very different than the one she last performed in. My Thoughts “Dead From New York” felt like a midseason episode to me. That’s not to say it was a bad episode; it made me laugh at more than one point in time, and everything related to Martha was fantastic. But it didn’t feel like an episode that should be leading into a season finale. I often complain about penultimate episodes largely being used by shows as piece-moving episodes that only seem to exist to set things up for a season finale. 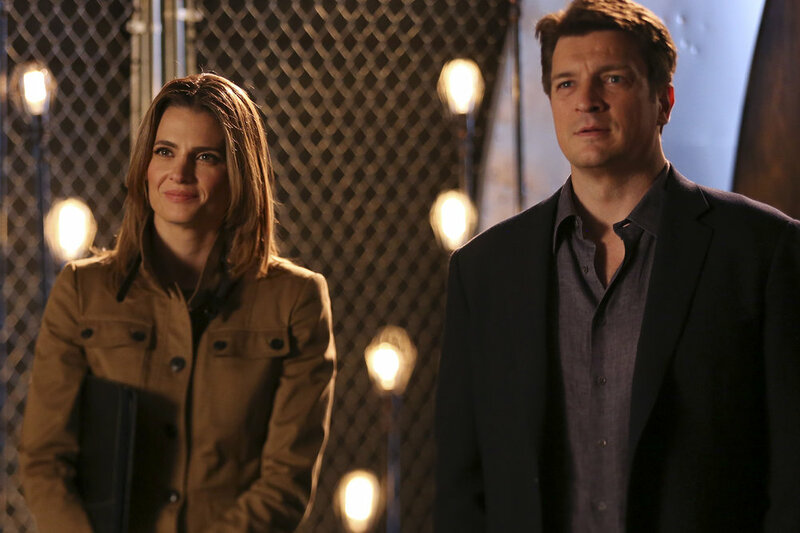 Castle bucked that trend last year with the incredible “Veritas.” This episode, however, didn’t move any pieces around for the finale, nor did it have the emotional weight and sense of closure offered by last year’s penultimate episode. I recognize that with Bracken and 3XK in jail and the mystery of Castle’s disappearance solved, there simply aren’t a lot of pieces to move into place for next week’s finale. The writers on this show had the unenviable task of writing a finale when the next season is not guaranteed and, at the time of writing, contracts had yet to be re-signed. They needed to craft something that could provide a serialized element for next season but could also function on its own if necessary. Because of that, maybe it’s best that they opted for a stand-alone episode leading into the finale, and it’s just my worries that always pop up during cancellation season that are getting to me. I think I just wanted more of an indication of what the finale and the show’s future might hold, but that’s about my personal preferences, not necessarily what works best for the show. All that being said, this is the type of episode Castle does well. It was lighthearted with a connection to pop culture, and it was full of great moments from the characters whom we have grown to love so much. This show has pulled off some very entertaining stand-alone cases largely due to the way the characters approach them, and this was no different. Though the case itself was largely forgettable, the characters made the process of solving it fun. Stana Katic has a great reaction face, and she got to use it very effectively while questioning Mickey. Liz was also able to voice to Beckett what every fan has been thinking since the start of the show: Her hair is improbably amazing at all times. Despite the randomness of the Carly Rae Jepsen song break in the middle of the episode, I’ll never complain about a cute scene of Castle and Beckett dancing together. Finally, solving the crime on live TV in the middle of a sketch parodying them was pure fun and fitting for a show that does such loving pop culture tributes. Though she wasn’t the focus of the episode, Susan Sullivan stole the show for me. Having doubts is human, even for someone as self-assured as Martha. She’s been off the stage on this sort of scale for 20 years, and it’s only natural to feel nervous about returning to something you’ve been away from for so long. Martha is an actress down to her very core. If she were to fail at this, who would she be? So I understand the urge to quit and run away. Sometimes it’s easier to not try than it is to try and risk failure. But whenever we have those very real moments of doubt and fear, we need someone in our lives who can lift us back up and remind us of what we know deep down. We need that person who believes in our ability to conquer all of those fears and be the person they see us as. And for Martha, that person is her son. Sullivan and Nathan Fillion have always worked so well together, and while we never see much of their relationship at once, it’s easy to feel the history between their characters. There is an easy closeness that the two bring out in each other, and it’s always a pleasure to watch. From our knowledge of the characters, we know this is a family who believes in big dreams. They take chances and risks and put their work out there to be publically scrutinized. But within those big dreams and hopes for themselves, Martha instilled a very strong belief in hard work in her son. Not the type of hard work that lends itself to an 80-hour a week job for a business you feel no real connection to, but the type of hard work that is willingly poured into your passions. Martha is making a comeback because she loves the theater and all it represents to her. She stayed involved in the community despite not being part of any major show for years. She put her heart and soul into that life, and Castle was right; she earned that moment. That beautiful, honest scene between mother and son led to the triumphant ending in the precinct. As Beckett has become a fully-integrated part of Castle’s home life, it was wonderful to see some of that home life make it’s way into her world. Her precinct family is his family now, too, and I can think of no better group to celebrate Martha’s successful return to the stage with her. At the end of the day, despite any misgivings I may have about this episode’s placement within the season, “Dead From New York” was an episode I will fondly look back on. I’ve said it before in my reviews of this show, but at this point in it’s lifespan, all I want is to hang out with the characters I love for an hour while they solve a crime. The procedural element isn’t going away—and I appreciate that they make an effort to try to keep it fun and original—but it’s the characters that keep me coming back, and I’m glad I got the chance to see Martha shine. And what characters they are and how much we care about them…we love them all. A real tribute to all the actors and writers for making us care so much. Martha makes every scene better and I truly hope we see more of her in S8. Heather – this is so on point. I have been so busy, I am only now getting around to read your insightful take on last week’s episode. I just nodded along to everything you wrote about Martha in particular. I also upon reflection think it was placed where it was for a reason. I do think Martha’s pause and fear was a foreshadowing for what we are going to see Beckett go through in the finale and what is going to set up season 8. Just a hunch, but that career crossroads I believe is a theme we are going to revisit tonight.